Una Blagojevic is currently spending her Third Year at Goldsmith, University of London, and is reporting about her most recent experiences. So far, I have been really enjoying studying at Goldsmiths. The reasons for my appreciation of it range from very banal to more sophisticated ones. Not only is the college situated in an old red brick building, behind which is a vast grassy area usually packed with students even on a rainy day, but the general atmosphere in the college is very inspirational. It is situated in the diverse south east area of London, which reminds me of Kreuzberg with its eccentric stores and unique people that can be seen on the streets. A more sophisticated reason is that one can, for example, hear the orchestra class playing, while getting lost in almost maze-like building. Above all, I’m impressed by how fascinating and engaging my courses are. One of the classes that I am taking is “Democracy, Nationalism and Dictatorship in Eastern Europe in the 20th century”. Personally, I was pleasantly surprised to see that the History department at Goldsmiths has a course dedicated to this topic, something I have always been very interested in. Perhaps what I value most about this course, and Goldsmiths in general, is that the system of teaching is such that the tutor usually informs students about outside lectures, or an art exhibition, or anything else that can lead us to further research. Most of my tutors want us to research independently from the classes. Lectures are informative, and they do not end in a definitive conclusion but leave the space for us to find an interpretation and bond deeply with the issues. 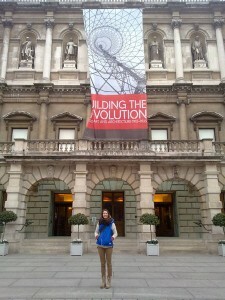 For instance, we discussed the Second World War and the ideologies of this period, when our tutor suggested that we pay a visit to the Royal Academy of Arts, which is hosting the exhibition called Building the Revolution. I stayed in London during the winter break mostly for the purpose of exploring the city more and visiting galleries and museums, and was able to visit that exhibition as well. It portrays Soviet art and architecture from 1915 to 1935, which is shown through a collection of photographs, sketches and paintings; however the absolute highlight of the exhibition for me came even before I entered the building. In the courtyard of the Royal Academy, a replica of Tatlin’s Tower took me by surprise. This replica is 40 times smaller than its actual size, however it still appears monumental and majestic. Its presence is even more enhanced by the fact that it is surrounded by the classical façade of the Royal Academy of Arts. The recreation of the tower which was to be a Monument to the Third International, outdoing even the Eiffel Tower in its greatness, is placed just opposite the monument of Sir Joshua Reynolds holding his palette and a brush (Sir Reynolds was the founder of the Royal Academy of Arts and also a painter). Whether intentional or purely coincidental, this arrangement attracted my attention and stirred my curiosity even more. Soon enough, I was in the building looking at the exhibition that examines the establishment and development of new building types through the language of the Avant Garde; to describe it in one word: geometry. Lines, triangles, cubes and other simple geometrical forms were repeatedly present in all the sketches and paintings, reminding me once again of Sir Joshua waving with his brush in the front yard. The new and radical visual language was to support the creation of the new world of Soviet Socialism. Thus, looking at the pictures of the buildings displayed, one could notice that the creation of communal housing was the best possible way to adhere to the goals of socialism. These new types of building were such that they almost forced tenants to interact with one another in a different way than it could have ever been imagined before. The message that was constantly echoing throughout the gallery, communicating itself to all visitors, was that an emphasis on function could and did dictate the artistic language of the early twentieth century. It was fascinating to see in person the interplay between art and architecture contextualized by this historical moment. The exhibition made me more than excited to do further research on this topic and added a new dimension to my understanding of this period. And even further, it helped me to recognize the topic which we have been examining in the seminars and lectures from a different perspective. My experience at the Royal Academy also made me aware of the inexhaustible diversity of possibilities that London constantly offers. I am happy to say that I feel lucky to be studying in London at Goldsmiths this year, and that it has already proved itself to be a very inspiring and a constructive year.